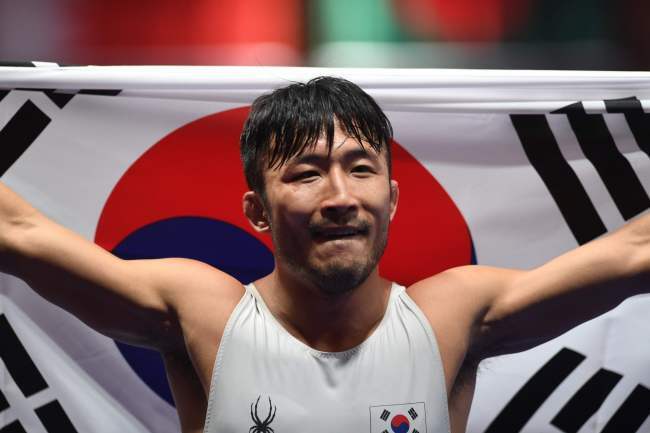 JAKARTA, Indonesia -- After picking up his second straight Asian Games gold on Tuesday, South Korean Greco-Roman wrestler Ryu Han-su had already started thinking about winning the ultimate prize -- an Olympic gold. Ryu defeated Almat Kebispayev of Kazakhstan 5-4 in the men's 67kg Greco-Roman wrestling final at the 18th Asian Games here. Among other titles, Ryu has also won the 2013 world title and the 2015 Asian championship. But the 30-year-old said he isn't done, not until he finally gets his Olympic gold in Tokyo in 2020. Despite his status as the favorite at the 2016 Rio de Janerio Olympics, Ryu didn't even win a medal, losing in the bronze medal match to Rasul Chunayev of Azerbaijan. Ryu said his latest Asian Games gold did little to erase that painful memory. "Winning at the Asian Games is nice, but my ultimate goal is to win an Olympic gold," he said. "I am not afraid of suffering from physical pains during practice. I'll keep putting in the work so that I'll bring home gold from the 2020 Tokyo Olympics." Ryu was dealing with issues in both of his elbows. He hurt his left elbow a couple of months ago, and then his right elbow acted up recently. But he maintained a positive, can-do mindset throughout. "When my two arms were hurting, I was determined to make the most of my two quick feet," he said. "I knew I wouldn't have an issue as long as I stuck to doing what I do best." Ryu said he was most grateful for his Greco-Roman teammate, Kim Hyeon-woo, for being his friend. Kim will go for his own gold medal in the 77kg clas Wednesday.